Goliathcasino is a brand owned by Goliath LTD, a company incorporated under the laws of Malta whose registered office is at Malta. The games on this website are powered by software belonging to Aspire Global International LTD, a Malta based company which is a fully licensed operator (MGA/CL1/408/2007) under the Malta Gaming Authority. In Great Britain only, the games on this website are operated by AG Communications Limited, a Malta based company with registration number C48328 and having registered office at 135, High street, Sliema SLM 1549, Malta, which is licensed and regulated by the United Kingdom Gambling Commission (Remote Gaming License Number 000-039483-R-319409-001). At Goliathcasino we are committed to provide fair play at all times. Goliathcasino utilizes the latest 128-bit Secure Socket Layer (SSL) encryption technology to ensure that sensitive data is transferred securely over the internet to our secure server, which is protected by the latest firewall. 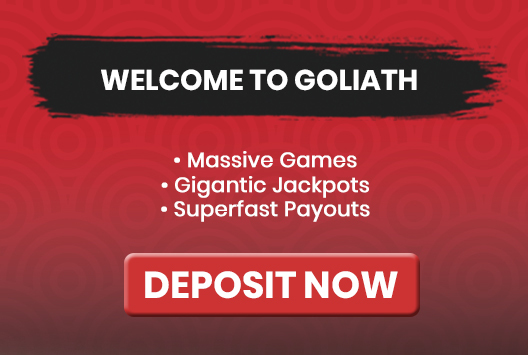 At Goliathcasino we want you to enjoy yourself and free your mind, at all times, that's why we offer a wide variety of deposit options and fast cashouts, all of which are user friendly and secure. All our credit and debit card transactions are processed by Aspire Global International LTD, a company located, licensed, and incorporated in Malta. Aspire Global International LTD, provides Goliathcasino with the best, safest and most secure transactions. For your knowledge it is illegal for anyone under 18 to open an account or to play on Goliathcasino. Copyright 2018- All Rights Reserved. Goliathcasino.com is a brand owned by Goliath LTD, a company incorporated under the laws of Malta. The games on this website are powered and operated by Aspire Global International LTD., a Malta based company with registration number C42296 and having registered office at 135, High street, Sliema SLM 1549, Malta, which is a fully licensed operator under the Remote Gaming Regulations of Malta MGA/B2C/148/2007 issued on the 17 August 2009 (this license incorporates the previous licenses held by the Company and list the old license numbers with their license dates) and regulated by the Malta Gaming Authority. Aspire Global International LTD have an Irish Betting License with license reference number 1014834. In Great Britain , the games on this website are operated by AG Communications Limited, a Malta based company with registration number C48328 and having registered office at 135, High street, Sliema SLM 1549, Malta, which is licensed and regulated by the United Kingdom Gambling Commission (Remote Gaming License Number 000-039483-R-319409-001). The games offered by isoftbet are approved and licensed by Alderney Gambling Control Commission, license number: 117C2. The current status of operators license can be found at: Gambling Commission.